Customer Connect is an initiative to upgrade our technology. Customer Connect will increase customer convenience, improve our infrastructure to help protect the environment, and prepare you and Halifax Water for the future. The initial phase of Customer Connect will upgrade water meters in homes and businesses throughout Halifax Water’s service area with state-of-the-art equipment. Are appointments available in my neighbourhood? You can view the Customer Connect meter installation map in a new browser window. Residents are encouraged to use the interactive map to see where meter installations are currently taking place (yellow sections indicated on the map). If you live in the area installations are taking place, please book your appointment as soon as possible. You can see estimated timelines for meter installations in other areas (grey sections indicated on the map) by zooming in on the map, or by searching your civic address. Weather and other factors that prevent Halifax Water from obtaining an actual meter reading will be eliminated. The meter and the transmitter will create a wireless network from your home to Halifax Water. Your water meter will show your when water is running. If you aren't using water, you may have a leak. The new meter technology will communicate wirelessly with Halifax Water eliminating the need to send a technician to customer homes and businesses to manually read meters. Closer to the meter upgrade completion date in 2020, monthly billing will be available. Monthly billing increases the ability for customers to manage their costs. An immediate advantage is the ability to provide data and better customer service in response to high usage questions. In the future, if a customer chooses, a web portal can be used to assist in managing their usage and costs. 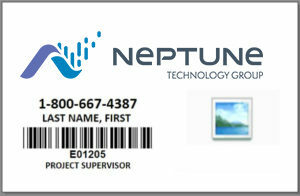 Halifax Water has contracted Neptune Technology Group to replace the meter in your home at no charge to you. 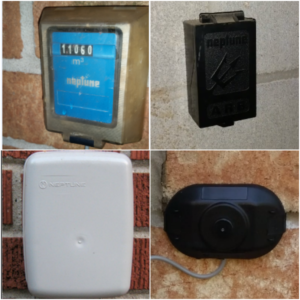 Neptune has installed millions of water meters for over 2,500 utilities and is a trusted resource. If, for any reason, you do not feel the person knocking at your door is part of the Customer Connect initiative, please contact Halifax Water Customer Care at 902-420-9287 . If you have questions, you're not alone. Below are some of the most frequently asked questions we get concerning our new water meter installation project. Yes, all customers must schedule an appointment to have their meter modernized. However, customers have an option to opt-out of the RF (radio-frequency) portion of a new meter installation. Please contact Halifax Water to start the opt-out process. Please remember, an appointment is still required to upgrade your existing meter to a new, non-RF meter regardless of their opt-out status for the RF portion of this program. Why do we need new water meters? Halifax Water is upgrading its water meters technology to be compatible with the latest meter reading technology that offers benefits such as improved customer service, system operation and environmental benefits. The meter technology currently installed at your home/business will determine if your water meter must be replaced. Not all properties will need to have their water meter changed, however a new transmitter will need to be installed at all properties unless the customer opts out of the RF device. For more information, please contact CustomerCare@halifaxwater.ca or call 902-420-9287. When do I have to book my appointment? 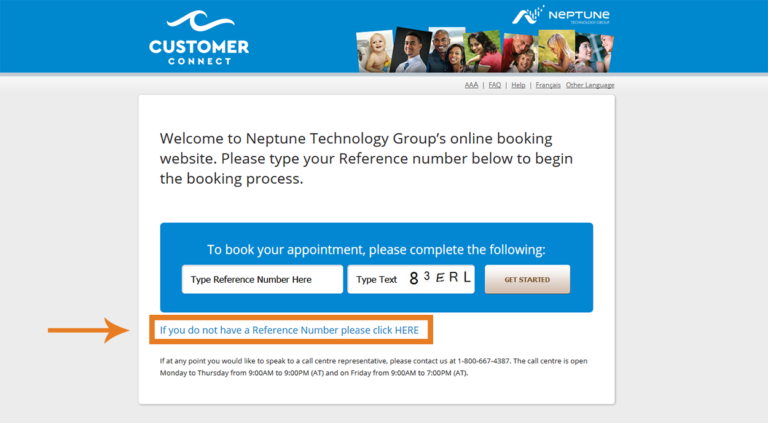 You will be notified when Neptune is in your area via an Appointment Notice sent directly to your home or commercial building. This Notice might be a letter or a pamphlet. When you receive the Notice, please schedule your appointment as soon as possible. You can book an installation appointment as soon as you receive an appointment notice in the mail. The appointment notice will have a reference number used to confirm your appointment. With your reference number, you will be able to book your appointment online at Customer Connect Booking Site from your computer, tablet or smartphone or by calling 1-800-667-4387. I’ve noticed something hung on my door. What is it? Neptune uses a variety of door tags to communicate with homeowners. Most often, door tags are used to indicate that you still need to book your appointment or that you have missed a scheduled appointment. It is important to read your door tag carefully to know what actions you need to take. There is NO CHARGE for the upgraded meter or the work to install it at your home or business. Is the radio frequency created by the new technology safe? Yes. The new water meters emit less radio frequency energy than many other commonly-used wireless devices, like cell phones, baby monitors, satellite TVs, and microwaves that are used daily by millions of people. Radio frequency moves through space at the speed of light. The new water meters use low-energy radio frequency waves to transmit information across distances.We have created a Radio Frequency Comparison Sheet to show the amount of RF emitted by a Customer Connect Water Meter Transmitter. Industry Canada regulates radio communication and broadcasting apparatuses and has a set of guidelines for protecting the public. The equipment we are installing complies with Industry Canada’s requirements. The World Health Organization and Health Canada are a few of the many credible authors of research studies showing no adverse effects from these radio frequency waves. The California Council on Science and Technology is another excellent source. Is my account information and meter data secure? Access to account information is restricted to authorized Halifax Water personnel, who need the data to perform important functions, including improving billing and customer service. The transmitter that sends your meter reading has a unique identifier that is transmitted along with the read data. This identifier is compared electronically to your account record to ensure that the meter reading matches the meter assigned to your account. Just like the old water meters, the new meters collect how much water you use. The main difference is the new meters collect more data throughout the day. No customer-identifying information such as names and addresses are stored in the meters or transmitted across the network. Protecting your data is a top priority. Using the same advanced methods as internet banking and ATM machines, the new water meter reading system uses proprietary protocols and encryption for your water usage data to ensure privacy, transmitting it to Halifax Water over a wireless network with multiple layers of security incorporated throughout the system. Security measures are tested and reviewed regularly to guard against unauthorized access. Who do I call if I have questions about the meter installation? What is a water meter? How does it differ from a transmitter? A water meter is a device that records water consumption. Your water meter is connected to a transmitter, which takes consumption information and sends (transmits) it to a remote reading device that collects this data. This information is then used for billing purposes. The water meter is usually found in the basement, near the main water shut-off valve. This shut-off valve is located where your water service line comes into your home. Again, this is usually in your basement. 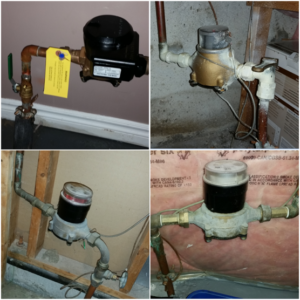 If you are having trouble locating the water meter, you may want to check your furnace room, utility room, or near your hot water tank. Water meters can occasionally be found in crawl spaces, or an installer may have to pass through such a space to gain access to the water meter. If the entry access to your water meter is less than 3 feet from floor to ceiling, the installer’s entire body needs to enter the limited space to complete the job. It is vital that you let Neptune know beforehand if a crawl space is involved. This will help the installer come prepared so that the required safety protocols are in place while the work is being completed. Where can I find my water shut-off valve? Your water shut-off valve is located where your water service line comes into your home, typically in your basement. How much space around the meter does the installer need to complete the work? 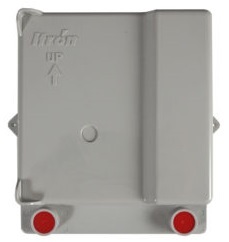 The installer will require a clear walking path to the meter area, as well as enough space to kneel down comfortably in front of the meter, with a small tool bag at his or her side. My water meter is installed behind drywall. What do I do? Neptune installers are trained to cut into drywall neatly and precisely. 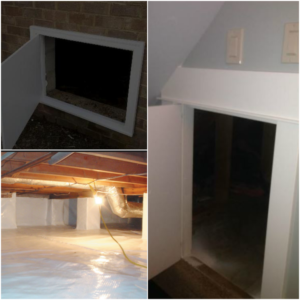 Once the installation is complete, this hole can be covered using an access panel or a cover box which will be installed at the end of the installation at no cost to you. What kind of work is involved on the outside of the house? Most water meters are connected by a wire to a transmitter on the outside of the home. The one currently on the outside of your home may resemble one in the image to the right. Once the meter and the transmitter are installed, Halifax Water can obtain transmitted consumption data using reading equipment, without entering your home. A new transmitter may need to be installed as a part of the water meter replacement or upgrade. In some cases, this may also require the installation of a new wire. This wire would connect to the meter inside your home. The new transmitter will look like the one to the right. How can I verify my technician’s identity? If you are unsure of the technician’s identity, please call Neptune at 1-800-667-4387 or Halifax Water at 902-420-9287. What kind of technical background and training does my installer have? 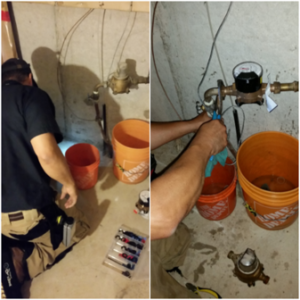 All installers are certified and trained to install water meters. Yes. Additionally, Neptune performs criminal background checks on all technicians. Will an installer ever show up to my home without an appointment? Yes, it is possible for an installer to show up at your home without an appointment. If an installer is in your area and Halifax Water has granted Neptune authorization, he or she may attempt to knock on your door and offer to do an installation with no scheduled appointment. If you are uncomfortable with this situation, simply tell your installer you would rather schedule an appointment. Alternatively, you may request to see the installer’s identification. You can also call Neptune at 1-800-667-4387 or Halifax Water at 902-420-9287 to confirm an installer’s identity. Under no circumstances will an authorized Neptune installer ask you for money. Are other communities pursuing Advanced Metering Infrastructure projects? and the Region of Peel. What is the timeline for the meter upgrade phase? The meter installation phase of Customer Connect is scheduled to begin in early summer of 2017 and expected to be completed in 2020. How will the project rollout? Installation of the new meters began with an initial roll out of approximately 350 meters in the Tucker Lake area in July 2017. Based on the results during this initial deployment phase, mass installation is being rolled out on a regional basis with project completion expected in 2020. Installation started in Halifax late in the summer of 2017. Dartmouth region installation began in Spring/Summer of 2018 and Bedford/Sackville installations will start in Winter/Spring of 2018-19. What is the cost to Halifax Water? The projected capital cost of the Customer Connect project is $25.4 million over a four-year period. The savings from reduced visits, water leakage and resources will help offset this cost down the line. How long does the installation appointment take? To read your new Halifax Water meter, first you must expose the solar panel to light to activate the display. When activated, the LCD display will first show a segment test and then toggle between a Reading and a Flow Rate measured in Liters per minute (LPM).